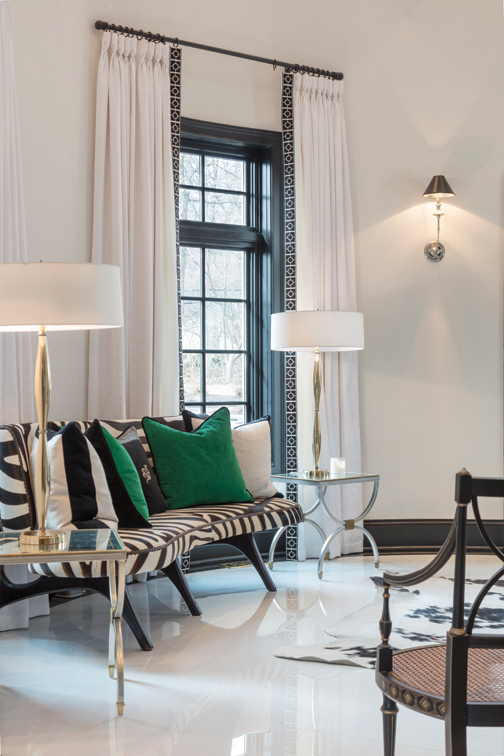 Enterprising homeowners, a talented architect and Joy Tribout Interior Design breathe new life into a historic Ladue residence. A lifelong resident of Ladue, the soon-to-be owner had been fascinated by the property since boyhood. When made aware that it was available for purchase, he jumped at the chance. His wife, however, was reluctant. The home had been empty for four years and looked a bit “forlorn” to her, but razing the structure wasn’t an acceptable option. 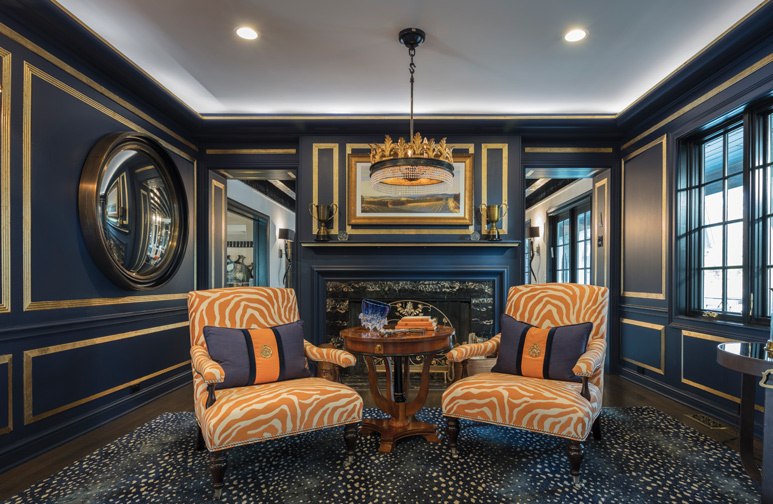 Inside, the décor was clearly high-end — traditional and ornate, with vast quantities of silk drapery, elaborate plaster molding and vintage Brunschwig & Fils wallpaper. But neither the style nor the spatial flow was particularly well-suited to the family’s contemporary lifestyle, which included two young sons. Still, the husband was vigorously enthusiastic, the wife acquiesced, and they took possession of the property in 2013. Since renovation of the home would be a massive undertaking, the couple first remodeled the guest house as a temporary residence while they developed their plans. Finding an architect who could grasp their vision proved difficult, but Darryl Labruyere of D.L. Design eventually “zeroed in” on their concept, and construction began. Built during the Edwardian era, the main house was originally designed for horse-drawn carriages and a household staff of servants. Every room would need to be redone, which meant the interior would have to be taken down to the studs. 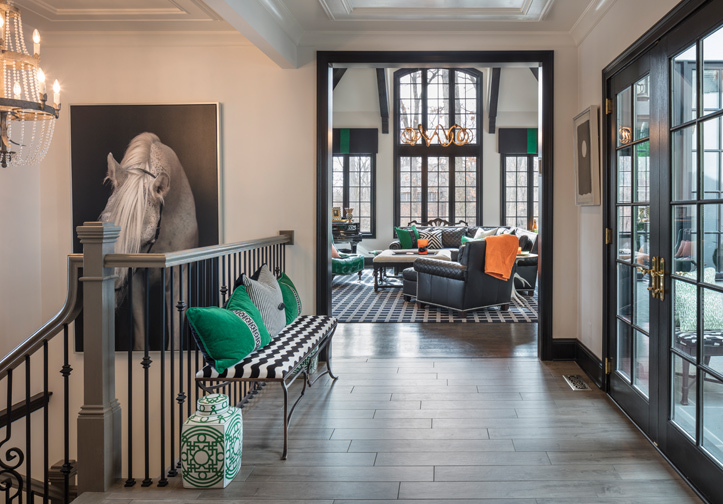 Inspired by the wife, the centrally located ballroom was transformed into a spacious kitchen and family room, the hub of the home and overlooking the rear lawn and gardens. 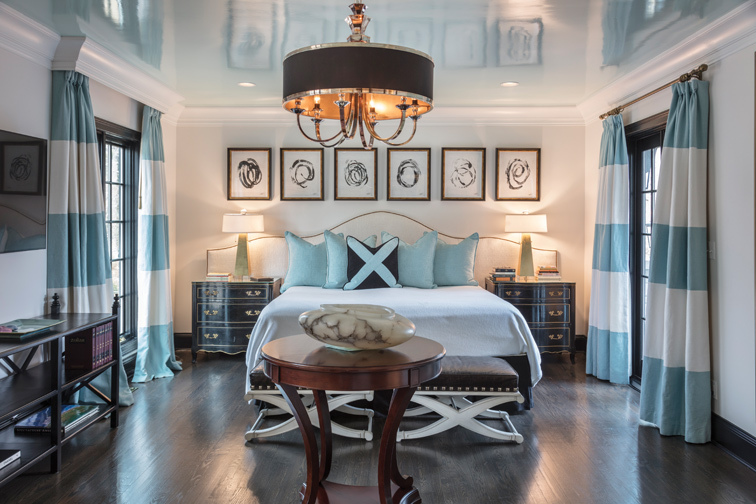 Elsewhere, the dining room was converted to a magnificent main-floor master suite, with a sitting area, private deck and spa, and an opulent master bath and dressing room. The original living room/library became the formal dining room and, capitalizing on the picturesque setting, all rooms on the main level were fitted with French doors that open to either a covered or open-air veranda. The new floor plan added a spectacular great room; bistro-style bar and TV room; butler’s pantry; and a finished lower level with fireplace, second kitchen, gym and full bath. A special haven for the wife, her private space is multi-functional, combining an office and craft room with an adjacent indoor kennel and dog bathing area. 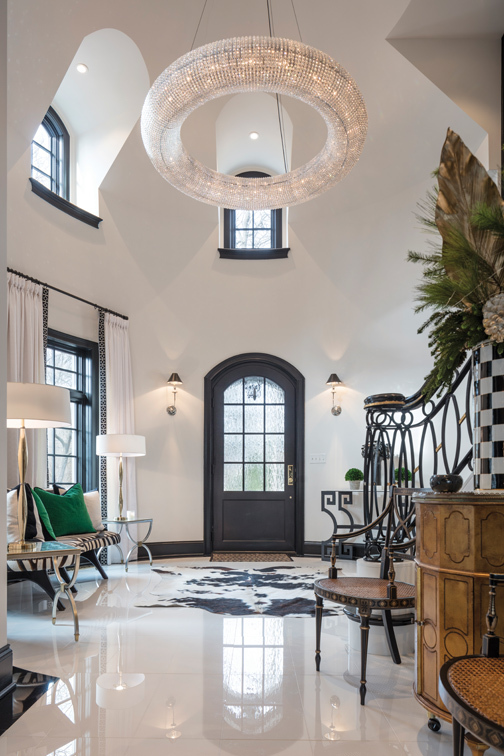 By 2015, construction was at the stage when it was time to start choosing interior finishes, and the wife was feeling rather overwhelmed by the prospect of furnishing 9,800 square feet of living space. Attracted by several items in the window of a local design shop, however, she met her “lifesaver.” Designer Joy Tribout has been a well-known industry professional for 35 years, and the two connected instantly. Now based in Belleville, Joy Tribout Interior Design features a 17,000-square-foot showroom and warehouse that the homeowner gleefully describes as her “candy store.” Open exclusively to clients except for two annual sale events, the business includes daughter Tammy Tribout-Caruso, who has 27 years of design experience, Joy’s daughter-in-law Anna, a team of expert seamstresses and a full-time artist. When asked to describe the interior effect she hoped to achieve, the homeowner replied, “I wanted ‘Joy’s style’ – dramatic and clean-lined, with no frills but lots of color accents.” Unfortunately, some of the home’s original elements they’d wanted to preserve —for example, decorative molding — had inadvertently been destroyed during demolition. 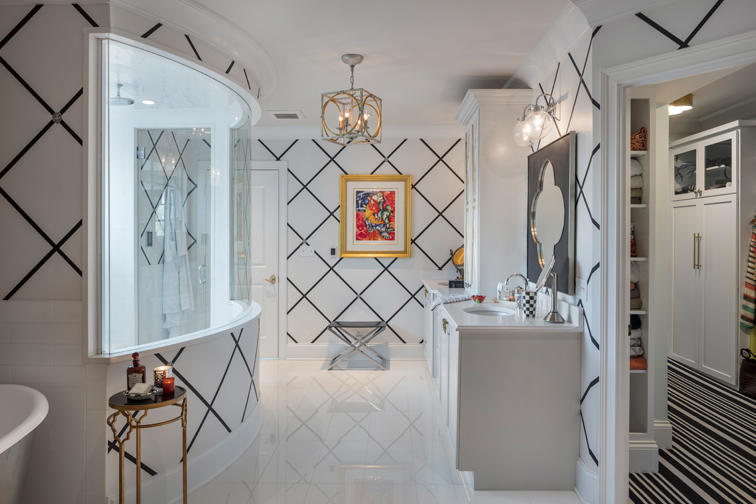 Tribout compensated for the loss by bringing in her artist, who hand-painted walls throughout the home to restore their vintage character, detailing and beauty. Throughout the main level, dark-toned woodwork provides contrast and calls attention to the design’s architectural assets, in particular, beams accenting the volume ceilings and window casings/muntins that emphasize the gorgeous views. Furnishing the spaces was accomplished on a room-by-room basis and proved a continuous source of excitement for the owner. “Installation day is the best day of the year!” she enthuses. “Joy’s truck pulls up, and we move things around until we have exactly the look we’re going for.” Her statement further illustrates the unique flexibility of working with Joy Tribout Interior Design. The firm’s innovative designers, large warehouse of items, and skilled staff of artisans offer clients a seemingly endless range of options. A clever example in the case of this home, two adjoining rooms are furnished with identical sofas, one custom-upholstered in a creamy hue, the other in a warm taupe-y shade. The owner can interchange these two pieces any time, accent them with colorful throw pillows, and create a fresh seasonal ambience for both spaces. Installation of a front drive and entryway were the final major additions to the residence. When purchased, the home included garage space for three vehicles, situated on the lower level at the rear and following the old carriage route. A curved walk provided the only access to the front door and a small entry foyer. The revised layout now welcomes visitors to a dramatic 2-story foyer, and the new main-level three-car garage is easily accessible from the front driveway. By autumn of 2016, the superbly renovated version of “Many Oaks” was ready for occupancy. To retain the charm of the landscape, great care had been taken to remove as few trees as possible, and the owners are now engaged in a “multi-season process” of restoring the grounds to their original glory, with flagstone and brick walkways, native plantings and fountains.